News first broke about America's Niger misadventure on October 4. "The real news here is that the US has forces in Niger, where they're conducting covert operations," this writer tweeted out. "Hashtag America First." Official media ignored the ambush of the American Special Forces, until the story gained anti-Trump traction. No word came from John McCain. Three weeks hence, the senator from Arizona is making history. McCain, who has never encountered a war he wasn't eager to prosecute, is questioning the folly in Niger. The senator from Arizona can run but can’t hide from the pollution he has left along his political path. Republicans wisely rejected war in Kosovo; McCain jettisoned party loyalty to call for bombs from above and ‘more boots on the ground.’ At the prospects of war with Iran, McCain burst into song, ‘Bomb-bomb-bomb, bomb-bomb-Iran.’ The possibility still makes this war ghoul smile. Before that, McCain promised a 100-year war in Iraq. Senator McCain's jingoism has encompassed Syria, Georgia, Mali, Nigeria, and China. Where the US could not effect regime change, as it did fecklessly in Afghanistan and Libya—McCain would typically call to side with an imagined local "friend of America” against an imagined "foe of America." Where his target country was beyond US bullying (Russia), the idea of the resumption of a cold war was an option McCain liked. He is currently fulminating over a slight delay in sanctions against Russia. When all efforts to tame the world militarily fail, McCain is partial to the idea of UN troops acting as his surrogates, say in Sudan. No war makes Johnny a sad boy. But now he's considering a subpoena over Niger. Playing out in Niger are the permanently entrenched, unchanging, American foreign-policy interests. Keen observers will detect a familiar pattern. Once again, the American bias everywhere is toward a powerful, overweening central state. This conceit has put our forces on a collision course with the tribal interests America toils to tame. Indeed, US foreign policy often flouts local authority. It certainly disavows separatists and generally discourages any meaningful devolution of power. Born of a loose confederation of independent states, America now stands for the strong centralized state. Our interchangeable leaders strive to see the same in the tribal lands of the Middle East and Africa. In Yemen, America is working to impose a central authority on "bickering sheikdoms." In the South alone, Yemen has 14 such principalities. Southern secessionists are at war with the north, have been for at least 139 years. There, "even the bottled water," notes the Economist, "is called 'South.'" There's no such thing as a united Yemen. Never was. Into this fray, the US has waded. So stupid and dangerous is our foreign-policy colossus that it imagines America is fighting al-Qaida by backing the Saudi-led coalition to vanquish northern Houthi rebels. The northern Houthi rebels, however, clearly wear many hats. More so than the invading coalition, the rebels are of the community and often for the community. As America's Emirati partners in Yemen are realizing, "Motivating recruits to push north is an uphill task even with the payment of bonuses. Those who were happy to fight for their own homes seem unenthused about fighting for somebody else’s." Would that the Empire's military would confine itself to that constitutional mandate: fight for home and hearth and no more. Alas, our soldiers have been propagandized to conflate fighting for American freedom with fights in Niger, Burkina Faso (yeah, I know) and Mali. Ultimately, all the spots America chooses to mess with are too complex for the prosaic American mind to grasp, for we are schooled to see societies unlike our own through a Disneyfied, angels-and-demons prism. More so than the Middle East, Africa is riven by tribal interests and dynamics. These, McCain or CENTCOM (the United States Central Command) have no hope of understanding, because they’re wedded to the idea that their own home (America) is nothing more than an idea, and never a community of flesh-and-blood people with a shared, treasured patrimony. Niger is no different. You’re told that the Americans and the French are empowering the local forces of Niger against the mythical ISIS. Poppycock. This is never the case. In Africa, as in Afghanistan or Iraq, the conflicts are regional, tribal, old, if not ancient. Tongo-Tongo, the Niger village that ambushed our unsuspecting Green Berets, had not been "infiltrated" by hostile forces; that's the take of Niger's central government, itself a very recent development. If past is prologue, it's fair to assume that the Niger government is vested in developing as a French and American client state with all the attendant perks. Villagers have likely learned not to wait for any trickle-down from the state. The Tongo-Tongo villagers enticed our forces to mill about, giving their homie militant benefactors just enough time to set up an ambush in a kill zone. Imagine! Locals don't particularly relish a visit from the American and French patrolmen and their Nigerien puppets. 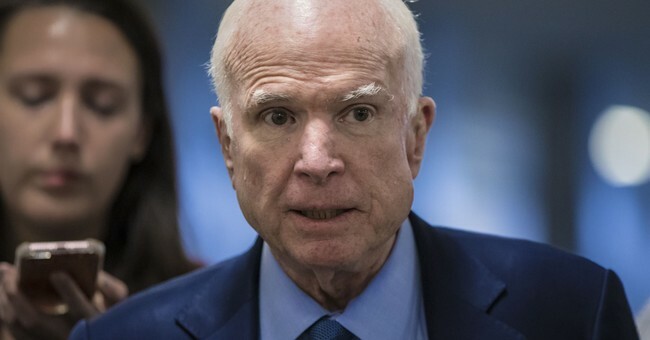 So, if John McCain's hatred of President Trump has driven America's most ardent warmonger to question the American intervention in Niger—that's a good thing.